6-Star 19,200 gross tonnage Luxury Ship, just 320 guests on board. These are no crowds, no endless announcements, no long lines. And the sense of spaciousness is no illusion - the ship has one of the highest space per guest ratios in cruising! On the Paul Gauguin, there is 1 crew member for every 1.5 guests, a very generous ratio assuring you of the highest level of personal attention. 8-Days cruise starting at $2,995 per person click for details. 4-Star ship, 30,277 gross tonnage with 670 guests. 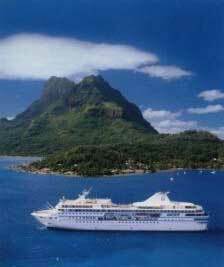 Sailing year-round in French Polynesia, Tahitian Princess is the perfect vessel for a South Pacific getaway. With more than two thirds of the ship's cabins featuring balconies and with a variety of dining and entertainment options, this vessel delivers Princess’ trademark "big ship choice" in a smaller, more intimate cruise environment. 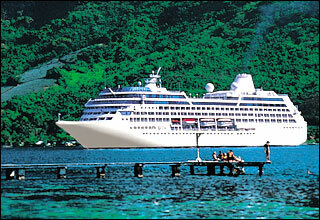 10-Day Polynesia/Cook Island cruise starting at $1,595 per person click for details. 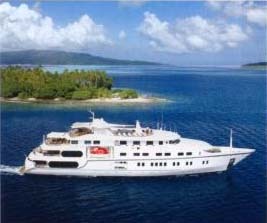 Experience the intimate beauty of Tahiti aboard the sumptuous 226-foot Ti'a Moana and Tu Moana cruise yachts, each featuring 37 elegant outside cabins. Each of these cruises may be combined with land accomodations before or after your cruise, allowing you to easily customize your vacation. 7 day cruise from $3,690 click for details.